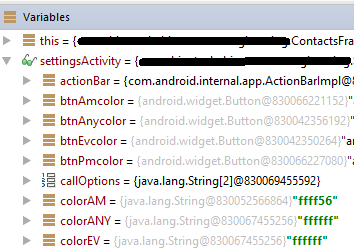 While running app on latest android devices, from ADT Eclipse, you may find difficulty in viewing LogCat data. As lots of other background services of different apps are running, logcat clearing out in a glimpse. 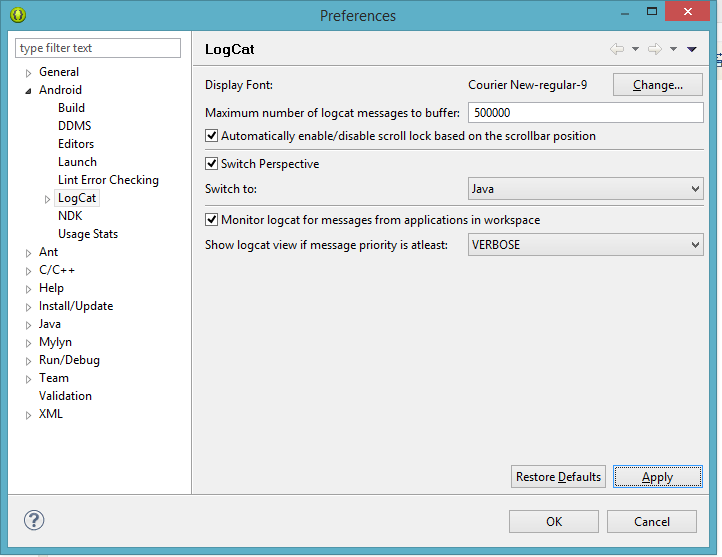 At this kind of situation, To view LogCat data you have to change a Eclipse setting as shown below..
Now you can able to see LogCat data. Could not resolve all dependencies for configuration ':library:_debugCompile'. > Could not resolve com.android.support:support-v4:22.0.0. > No cached version of com.android.support:support-v4:22.0.0 available for offline mode. and Rebuild app… Fixed the issue. 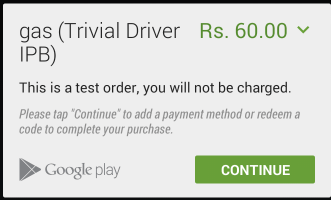 After uploading Trivial Drive app in Alpha Testing, and configuring Store listings and In App products and charges, published app in Google Play Developer Console. SO, I just changed code for SKU_ProductId constants to match with In-App products created in Developer console. And Changed application version code and name in manifest file, Generated new APK file and uploaded to Developer console Alpha Testing. After 2-3 hours waiting, its got published.. and I see everything is working fine. to summarize whole thing, you just need to use same SKU_ProductId in code, which is created in In-App Products developer console. Recently while working with tabs, I see this situation onActivityResult , always getting 0(RESULT_CANCELLED). I have four activities A-Activity,B-TabActivity,C-Activity, D-Activity. where A starts TabActivity B, and in this TabActivity, Im displaying 2 tabs C and D as child activities. After applying this change, Im able to get the exact resultCode in Activity A. After searching for a while, I found the issue is due to entering invalid characters like comma(,), Plus (+) etc signs in Key creation dialog. So after removing it, Im able to generate APK file successfully. In Android Studio, when clicked menu Build-> Generate Signed APK file, the dialogs displayed for generating APK file, doesn’t allow you to edit the APK file name. It just applies default app name to build file, unlike ADT Eclipse. We have to write Groovy code in Gradle build file to, Generate singed APK file with Specific name. Here i’m just giving an example how we can write it. 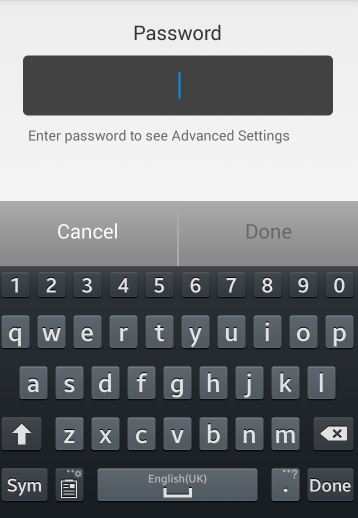 For eg: If your app name is helloWorld, If you generate APK build file, it will creates helloWorld-release.apk file. But if you want to generate Apk file with appending version name, and change filename like “HelloWorld-1.0v.apk”. That’s it. 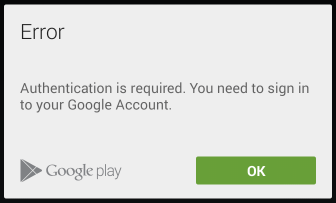 Now Goto Build-> Generate a Signed APK… just follow the dialog, click Finish, and you will see APK file created with your specified name. After adding all Store listings information, You may still see that Publish your app button is disabled and you can only Save Draft. When you click on Why can’t I publish? link you may see below reason. * You need to acknowledge that this application meets the Content Guidelines. * You need to acknowledge that this application complies with US export laws. If you just stuck on this, you just need to make one more step to be able to Publish app. On left side menu panel, Click on Pricing and Distribution. Scroll to the bottom of the page that comes up. There you will find the place to acknowledge that the app meets Content Guidelines, and to acknowledge that it complies with US Export Laws. Just check these points and Save changes. You’ll be able to Publish the app. This post is for beginners, to give basic understanding to debug project in Android Studio. To debug Project, you have to place breakpoints at the code line, of a method or class, So the debugger will stop at that break point while debugging. To place a break point just click on work space left side border you can see red dot. To remove breakpoint just click on red dot again. *generally, while debugging app slows down. So, You can use another debug option to debug at a Specific Screen. At times you may want to debug code in a Specific screen at a particular line for eg. on a Save button click event method. So, Place a breakpoint at that particular onClick(View v) method. 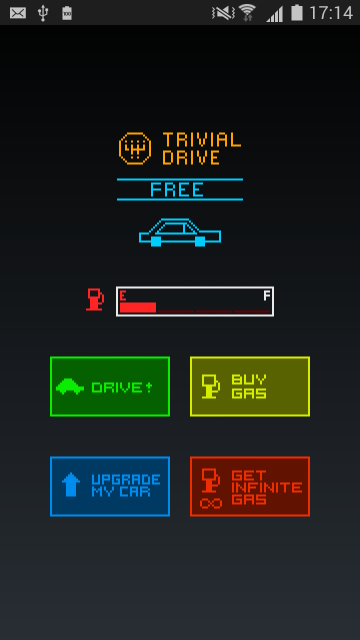 After running app on device or emulator, navigate to the Specific screen and just before clicking on Save button(button event where you want to debug code) in screen. Click on Attach debugger to Android Process menu button in Android Studio work space. You’ll see a dialog to select a process, here select your process (and wait for a moment for debugger to attach to process) and now click on the Save button in that Specific screen. You can see Debug console at the bottom and debugger waits at break point at a specific line to enable you start debugging. Press F7 or click on the below debug console button icon, to move debugger to in to a inner class method. (This is very rarely used). Use it whenever a method call is escaping from debugging. Press F9 or click on the below debug console button icon, to execute code up to next break point..
Press Ctrl+F2 or click on the below debug console button icon, to stop debugger execution, when you click on this button, debugger stops execution and app runs normally. these buttons are mainly used for debugging. If you understand these button functions first then You can see and understand other button functions easily. Hope it makes sense and helps somebody.